With the vast offerings of New York City world-class restaurants, it is hard to go wrong. This applies to vegan restaurants found throughout NYC, as well. Vegans can rejoice, as there are delicious, plant-based restaurants in every borough of the Big Apple. Offering traditional dishes with a vegan twist, Seasoned Vegan brings affordable comfort food to Harlem. The menu offers anything from "chicken" nuggets to burgers to spaghetti at prices averaging around $15.00. Google reviewers love the Seasoned Vegan for the delicious food, especially the cupcakes, and the homey atmosphere. Residents of the Upper East Side can enjoy vegan fine dining at Candle 79. Vegan and non-vegan Zagat reviewers praise the cauliflower risotto, spaghetti and wheatballs, wild mushroom flatbread, and desserts, but complain of pricey dishes. The most expensive dinner entrée is priced at $25. Beyond Sushi is a 100 percent vegan sushi restaurant offering plant-based foods at five locations throughout Manhattan. Items on the menu include Asian-inspired soups, salads, dumplings, noodle salads, and of course, vegan-sushi, all under $11.00. Beyond Sushi is revered for its savory, healthy, and light twist on vegan food resulting in many return customers. This quick lunch spot offers a vegan take on classic American staples, such as burgers, breakfast sandwiches, and Philly cheese steaks, for about $9.50 each. Blossom Du Jour has locations in Chelsea, Midtown West, Upper West Side, and Midtown. Reviewers say for "vegan fast-food," Blossom Du Jour does a good job, providing moist patties and delicious cauliflower bites. Offering gourmet toasts, risottos, and imaginative vegetable combinations, Avant Garden is an open-bar kitchen found in East Village with moderate pricing of $12.00 to about $22.00. Avant Garden received 4.6 out of 5 stars on OpenTable with one reviewer stating, "Super fresh, inventive, and delicious cuisine that highlights the vegetable." When looking for vegan cheese, look no further than Riverdel in Brooklyn. This vegan cheese shop offers a vast selection of cheese and custom made sandwiches under $10.00. Vegans obsess over Riverdel quoting, "Riverdel is revolutionary to the vegan community," and they love items such as carrot lox bagels, caramelized onion camembert and parmesan cheese, and the McDel and grilled cheese. 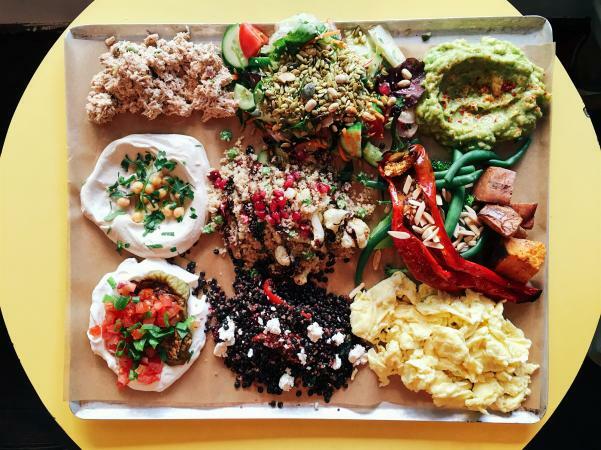 Located in Chinatown, Jajaja combines Mexican and vegan food into dishes reviewers call "colorful," "flavorful," and "spicy." Jajaja's menu includes items such as Hijiki-Hearts of Palm Ceviche for $12.00, Beet & Pumpkin Empanadas for $9.00, and Chayote Fish Tacos for $8.00. New York City has no shortage of delicious vegan food to choose from. Whether you are looking to celebrate an anniversary with a gourmet vegan experience, need a vegan charcuterie board, or are just grabbing a quick sandwich, NYC has you covered with vegan selections.